“Both Sides of the Sky” includes originals, covers, and even collaborations with Stephen Stills. Recorded from 1968 to 1970, the 13 tracks on Both Sides of the Sky—10 of them previously unreleased—offer no dramatic revelations, but fans will find much to savor. His final years found Jimi Hendrix both reaffirming his roots and seeking a more thoughtful approach that toned down the dazzling flash of his commercial breakthrough, Are You Experienced?, in favor of subtler pleasures. 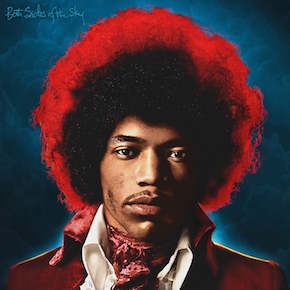 There’s plenty of blues here, including his own “Hear My Train A Comin’” and covers of Guitar Slim’s “Things I Used to Do” (costarring fellow guitar-slinger Johnny Winter) and Muddy Waters’ “Mannish Boy.” Hendrix clearly enjoyed collaborating with his peers, as witnessed on a couple of tracks sung by Stephen Stills: the middling “$20 Fine,” where Hendrix contributes guitar, and an intriguing, pre-Crosby, Stills, Nash and Young version of “Woodstock,” on which Jimi plays bass. Two standouts, the dreamy “Send My Love to Linda” and the head-spinning seven-minute instrumental “Cherokee Mist,” hint at spacier avenues that would never be fully explored, alas. While Both Sides of the Sky is extra-credit listening, it’s time well spent for the faithful.